When I watch the nightly news, I get the impression we are witnessing crisis after crisis. California wildfires. Severe flooding in Texas and the Midwest. The latest quote from Donald Trump or Ben Carson. Terrorist attacks in Beirut, Paris and Mali. There was a hurricane in and around New Orleans 10 years ago. Does anybody remember? Only on the anniversary date, unless you live there. We’ve moved on from that crisis because of so many others. Columbine, 9/11, superstorm Sandy, Sandy Hook, Boston Marathon … and on and on. But the scariest story I’ve heard about in a long time has nothing to do with any of those events. In the current issue of Reader’s Digest, Kathryn Schulz writing for The New Yorker describes a potential underground earthquake in the Pacific Ocean and subsequent tsunami that could devastate Washington State and Oregon in the near (or distant) future. When it hits, the coastal residents – many of whom are elderly and not mobile – will have about a half-hour to escape to higher ground. They won’t make it, with catastrophic results. Very few people are talking about it, much less preparing for it. Living in Ohio, I didn’t even know that fault line existed. Which leads me to this question: Is there more to life than just living from crisis to crisis? Can we not prepare for or control anything in our lives? Yes, we can. But we have to be intentional about it. In the book, Covey offers a four-quadrant matrix of the urgent (and not urgent) and important (and not important). In the urgent/important quadrant are crises, pressing problems and deadline-driven projects. These often define our daily lives. Covey explains that we need to intentionally spend time in the important/not urgent quadrant, which includes relationship building, pursuing new opportunities, planning and recreation. We know these things are important, but we won’t make time for them unless we do it intentionally. We can’t eliminate crises, but we can reduce their influence on us. Exhibit A: the presidential campaigns. The Republican National Convention is July 18-21, 2016, in Cleveland. The Democratic National Convention is July 25-28, 2016, in Philadelphia. The presidential election is Tuesday, Nov. 8, 2016. With the rhetoric that both sides of the aisle have poured out for months already, you’d never know the conventions are still a near-full-term-pregnancy away. I’ve posted more than once on timelines: Chill. The landscape of both primaries will change dramatically in the next eight months. We aren’t voting tomorrow. Exhibit B: the Cleveland Cavaliers’ NBA Championship run. Here in northeast Ohio, sports fans are worried that several Cavs players are injured, a couple rather severely, and that the team isn’t playing with the passion that’s required to win the title. Not-so-bold prediction: The Cavaliers will make the playoffs, which start April 16, 2016. As long as the team is healthy and in synch by then, all will be well. The Cavaliers cannot win the NBA Championship in November. What important things are we missing because we are crisis-driven? Exhibit A: Every year about this time, I’m amazed that those of us who live in cold-weather climates forget how to drive in snow. When that first dump of white stuff hits, far too many of us slide into ditches and each other. Every year. Will we ever take the necessary time to learn, and to pay attention to our surroundings? Exhibit B: In Western cultures about 90 percent of us marry before age 50. In the United States, 40 percent to 50 percent of us divorce, says the American Psychological Association. The divorce rate for subsequent marriages is even higher. Covey said building relationships is important but often not urgent. We need to schedule time for this in our busy lifestyles. Many of us don’t do nearly enough of this. Exhibit C: We get so caught up in Black Friday sales and presents under the tree, we forget “the reason for the season.” We’re so busy with holiday parties and shopping and jobs and visiting each side of our family, that we don’t take time to celebrate the people we’re with, or the baby in the manger. Like Santa Claus, it seems that we try to cram the entire month of December into one night. Exhibit D: We forget that the world doesn’t revolve around us. We offer a token donation to the local food bank or clothing drive or a check in the church offering plate to appease our conscience in December. Then, we go our merry way and forget that such needs persist year-round. What is important to you? Do you make time for it? Let’s each of us take time to answer this question for ourselves. Then, let’s take even more time to actually do something about it. We might have to give up something unimportant or even let go of some of our crises to find that time. But, by definition, if it’s important, it’s worth doing. While volunteering last week at an American Red Cross blood drive in downtown Cleveland, I met a donor from North Canton. James and his wife have been married 48 years. He’s a talker, a doer, the type who doesn’t sit still. In a five-minute conversation, James had me pegged better than some people who’ve known me for decades. I certainly wish my most recent employer understood me like that. I did not do the Ice Bucket Challenge last summer. No one asked me, and I likely would have said no if I was asked. Not that the challenge was a bad thing. It raised millions for ALS research. But that’s my point: Since everyone was doing it, ALS research did not need my money. There are plenty of other causes that receive far less publicity and are just as needy. I’ll donate there. Anonymously, if possible. 2. Many people on Facebook are superimposing the colors of the French flag over their cover photos in support of those who died in Friday’s terrorist attacks in Paris. Again, a worthy thought. Again, I am not going to do it. Paris isn’t the first city victimized by terrorists. Perhaps it won’t be the last. Will we change our colors again the next time it happens? And the time after that? Indeed, Paris wasn’t even the first city victimized by terrorists last week. Just the day before, on Thursday, Beirut fell victim to two bombers who killed 42 people. According to the New York Times, Facebook did not offer its members the option of superimposing the Lebanese flag over their cover photos to support the Beirut victims. I’ve seen other articles saying that we aren’t as interested in Beirut as we are in Paris – a main reason being that Americans frequently travel to Paris, but not to Beirut. But let’s remember both. Beirut has people too – who may need our support as much or more than Parisians do. Even if it’s not as popular to support a Middle Eastern city. I have Facebook friends who are Tea Party Republicans, as far right as they can get. I also have friends who are unabashed liberals, as far left as they can get. Most of my friends are somewhere in between, on both sides of center. I cultivate that. Write this on my tombstone: He got along with all types of people. To be my friend, you don’t have to agree with everything I stand for. I don’t necessarily agree with everything you do. I can respect you and be your friend anyway. Why is this such a hard concept for most Americans to understand? I think differently than most Americans do, but I wish I didn’t. Before I post something on Facebook (or LinkedIn), I carefully consider what my friends on the right and the left are thinking. I’m not afraid to challenge your ideas. I like intelligent discussion. I don’t know everything there is to know about any issue. So, enlighten me. I hope I can enlighten you a little bit as well. Many posts spout vitriol, with no intent to start a discussion. I’ve been tempted to tag a conservative post on a liberal’s timeline, and vice versa. I haven’t done it, but I’ve been tempted, just to set you off. My wife has a civil engineering degree, tutors math students, works in the financial aid office of our local community college and is taking an accounting class. In case you couldn’t tell, she likes numbers, logic and all things predictable. One of her tutoring students recently worked on a ratio problem. There were certain ratios of red cars and blue cars in a parking garage, and one of the ratios in the problem was not possible. Which one? Ratios are fine. They serve a valuable purpose. There’s nothing wrong with math. But in my mind, two plus two does not always equal four. Some of you understand this. Who will help me search for the purple car? To be my friend, you don’t have to agree with everything I stand for. I don’t necessarily agree with everything you do or say. I can respect you and be your friend anyway. The world does not revolve around you. (Or me, of course.) You are not always right. The world is rarely black and white. Artists know this. We see the world in multiple colors. The radio station I listen to most began playing Christmas music around the clock during the first week of November. At least they waited until after Halloween. Boo. Or is that bah humbug? Many retailers start their Black Friday sales on Thanksgiving Day. A definite bah humbug. Most of us spend the fourth Thursday of November eating turkey and all the trimmings, and watching the Detroit Lions lose and other forms of football. There’s a holiday in there somewhere. At least, there used to be. Thanksgiving began on our soil before the United States was formed. According to history.com, In September 1620, a small ship called the Mayflower left Plymouth, England, carrying 102 passengers — religious separatists seeking a new home where they could freely practice their faith and other individuals lured by the promise of prosperity and land ownership in the New World. After a treacherous crossing that lasted 66 days, they dropped anchor near the tip of Cape Cod. One month later, the Mayflower crossed Massachusetts Bay, where the Pilgrims, as they are now commonly known, established a village at Plymouth. Only half of those passengers survived the winter. In March, the remaining settlers moved ashore, where they received a visit from an Abenaki Indian who greeted them in English. Several days later, he returned with another Native American, Squanto, a member of the Pawtuxet tribe who had been kidnapped by an English sea captain and sold into slavery before escaping to London and returning to his homeland on an exploratory expedition. Squanto taught the Pilgrims, weakened by malnutrition and illness, how to cultivate corn, extract sap from maple trees, catch fish in the rivers and avoid poisonous plants. He also helped the settlers forge an alliance with the Wampanoag, a local tribe, which would endure for more than 50 years. 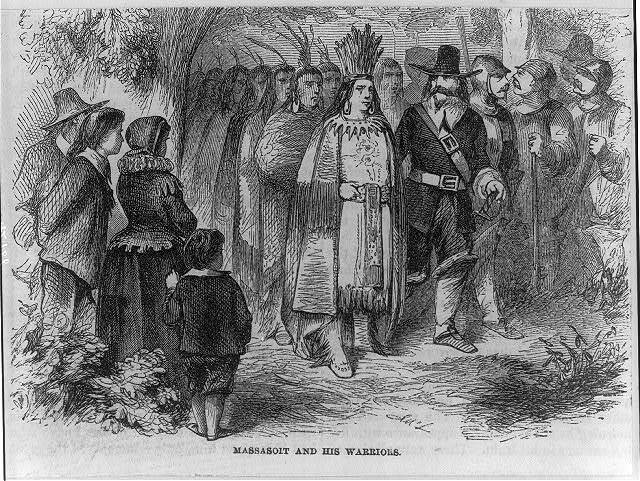 In November 1621, after the Pilgrims’ first corn harvest proved successful, their governor, William Bradford, organized a celebratory feast and invited a group of the fledgling colony’s Native American allies, including the Wampanoag chief Massasoit. Now remembered as American’s “first Thanksgiving” — although the Pilgrims themselves may not have used the term — the festival lasted for three days. Pilgrims held their second Thanksgiving celebration in 1623 to mark the end of a long drought. Days of fasting and thanksgiving on an annual or occasional basis became common practice in other New England settlements as well. During the American Revolution, the Continental Congress designated one or more days of thanksgiving a year, and in 1789 George Washington issued the first Thanksgiving proclamation by the national government of the United States; in it, he called upon Americans to express their gratitude for the conclusion to the country’s war of independence and the ratification of the U.S. Constitution. In 1817, New York became the first of several states to officially adopt an annual Thanksgiving holiday; each celebrated it on a different day. In 1827, the noted magazine editor and writer Sarah Josepha Hale — author of the nursery rhyme “Mary Had a Little Lamb” — launched a campaign to establish Thanksgiving as a national holiday. President Abraham Lincoln finally heeded her request in 1863, at the height of the Civil War. He scheduled Thanksgiving for the final Thursday in November, and it was celebrated on that day every year until 1939, when President Franklin D. Roosevelt moved the holiday up a week in an attempt to spur retail sales during the Great Depression. Roosevelt’s plan, known derisively as Franksgiving, was met with passionate opposition, and in 1941 the president reluctantly signed a bill making Thanksgiving the fourth Thursday in November. Thanks to FDR, the holiday does have a commercial twist. So, what are we thankful for anyway? It’s been awhile since I made a list. I don’t have to think hard to find plenty of reasons to give thanks: Good health, food on the table and in the refrigerator, a home over my head and a wonderful family, for starters. I never want to take those things for granted. I’ve been out of work most of this year, but financially we’re doing fine. I’m very thankful for that. With more time on my hands than I’m used to, I’ve been expanding my volunteer efforts. That helps give life meaning. And I began this blog to get back into writing. Thank you for reading it. When our three sons were in high school, the four of us would play Ultimate Frisbee on Thanksgiving morning with a group of guys at the local high school. The game continues, but we’ve all moved away. I miss it. After the game, we’d prepare for the traditional Thanksgiving meal, either at our house or at my parents’ house an hour and a half down the highway. That family meal is my favorite of the year. The food is so good! So is the family get-together. This year, my sister and her boyfriend will join us. And we aren’t too upset when the Lions lose, since we kind of expect it anyway. Before we dive too deeply into the Christmas season, let’s take a moment to give thanks. For something. For someone. No matter what our circumstances are, whether we can afford a big turkey meal or not, we should give thanks. For life. For God. For our country. For so much more. I try to avoid certain terms when writing or speaking because they mean different things to different people. We get judgmental when we assume everyone else understands what we’re saying. But we come at life from different angles, experiences and perspectives. Here’s a few hot-button terms, alphabetically listed, that we should use carefully. Alien: Extraterrestrial life or, according to http://dictionary.reference.com/, a foreigner who has entered or resides in a country unlawfully or without the country’s authorization; or a foreigner who enters the U.S. without an entry or immigrant visa, especially a person who crosses the border by avoiding inspection or who overstays the period of time allo wed as a visitor, tourist or businessperson. Often called an illegal alien, this is a negative term for immigrant. Politically, what to do with “illegal aliens” is a major sticking point in Washington, D.C., these days. Co-exist: Often seen on a bumper sticker. It means people should get along with each other, no matter their religious views. Most of us would agree that we should do this. Or, it could mean that all religions are equal. Christians, in particular, do not subscribe to this. Jesus claimed to be the only way to God. All are invited, but most do not accept the invitation. Conservative: According to http://dictionary.reference.com/, disposed to preserve existing conditions, institutions, etc., or to restore traditional ones, and to limit change. According to http://www.studentnewsdaily.com/, conservatives believe in personal responsibility, limited government, free markets, individual liberty, traditional American values and a strong national defense. They believe the role of government should be to provide people the freedom to pursue their own goals. Conservative policies generally emphasize empowerment of the individual to solve problems. Also, conservative frequently refers to the Republican Party. Are all Republicans conservative in every way? If they were, there wouldn’t be any debates over the next possible GOP presidential candidate. Differences: People are different. Is this a good thing, or not? Depends who you ask. Men are different than women, for example, physically, emotionally and often in the way they think. Does that make men superior? No, of course not. But you couldn’t tell that by the way some people talk and act. Diversity: See “differences.” Diversity often refers to racial or ethnic differences. Diversity should be a good thing, but not everyone sees it that way. Evolution: There are two definitions: All beings were created from one species, or each species evolves within itself. There is archaeological evidence for the second definition, but none for the first. No species evolved from another species; man did not evolve from an amoeba or a fish or an ape, for example. Within species, sometimes an animal will lose a tail if it’s not needed, or humans in some cultures grow taller over time, for example. Inclusion: Differences matter. “Inclusive” people respect those with physical and mental disabilities, especially among children in the classroom. But when children with mental disabilities cannot keep up with their peers in a public school classroom, should the school district be held accountable? This is part of the issue with federal and state testing programs. Other people expand the definition of inclusion to include respect of issues related to race, ethnicity, national origin, gender, age, beliefs, ability levels, economic status, sexual identity, gender identity and religion. There are many differing opinions on all of that. Liberal: According to http://www.studentnewsdaily.com/, liberals believe in government action to achieve equal opportunity and equality for all. It is the duty of the government to alleviate social ills and to protect civil liberties and individual and human rights. They believe the role of the government should be to guarantee that no one is in need. Liberal policies generally emphasize the need for the government to solve problems. Also, liberal frequently refers to the Democratic Party. As with conservatives and Republicans, not all Democrats follow every liberal viewpoint. Love: What is love? There are a myriad of definitions. This requires its own essay. I’ll write it eventually. Peace: Is this the absence of war, or is it something more? Is world peace different than, say, peace in our hearts? Spirituality: According to www.psychologytoday.com, spirituality means something different to everyone. For some, it’s about participating in organized religion: going to church, synagogue, a mosque and so on. For others, it’s more personal: Some people get in touch with their spiritual side through private prayer, yoga, meditation, quiet reflection or even long walks. Truth: Before sending Jesus to be crucified, even Pontius Pilate, sarcastically, asked, “What is truth?” Truth is a fact or belief that is accepted as true. But we can’t always agree on what is true. The best definition of truth I’ve heard is to apply this standard: Is it true for all people, of all ages and cultures and living standards, in all parts of the world, for all time – past, present and future? Many of these terms have religious and/or political meanings. This is why, in some circles, those two topics are off-limits for discussion. How do we discover “truth” if we silence discussion? By talking about these issues, truth will win out, eventually. This is what the United States was founded on. As the holiday season approaches, we annually debate whether a Christian manger scene should appear in public places. Why not? Let other religions post scenes important to them in public places in their proper season as well. Instead of excluding everyone, let’s include everyone. Let’s foster discussion. With respect. Truth will win the day. Why are we so afraid of that? Do we not even know what we believe ourselves well enough to defend it? Just asking. Because I can.